THE Foreign Office has said it will do all it can to help bring Mark Middlehurst home. Mark has been in a critical condition in hospital in Perth, Australia, after suffering a severe brain injury as the result of an quad bike accident. His family, who live in Billinge, have travelled to Australia to be with him but need to raise almost £25,000 to reach the total in a matter of weeks so that he can make the journey back to the UK, accompanied by a full medical team. The St Helens North MP said: “I have been in touch with Mark’s parents Julie and Malcolm since shortly after his tragic accident. “I and my office are liaising closely with the family to do whatever we can to help get them the support they need in Australia, and to enable them to make the journey back to the UK with Mark. Family friends Paul and Sue Darbyshire launched a fundraising appeal shortly after Mark’s accident on November 10 and raised more than £25,000. But it was only last week that they found out it would cost almost twice that to get him home. 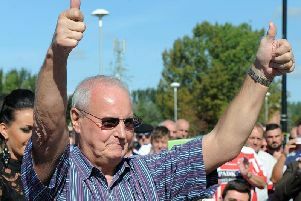 “I know they have received tremendous support from the community in St Helens and I know everyone will get behind them to help raise the money they need to get Mark back home to Billinge,” Mr McGinn said. “I am grateful to the Leader of the House for his assurance that the Government and the Diplomatic Service will do everything they can to help the Middlehursts, and I will be in contact again with the Foreign Secretary next week to ask for an update.